Was Jesus born in the bleak midwinter? Understood as poet Christina Rosetti meant it, the answer to the question posed in the title of this post is, Yes. English poet Christina Rosetti penned the poem, originally titled “A Christmas Carol,” sometime before 1871 at the request of William James Stillman, editor of Scribner’s Monthly, where the poem was first published in January 1872. The fact that she titled it the way she did seems to imply that Rosetti’s goal was for the poem to be used as a carol, but it wasn’t until after her death that it appeared in the English Hymnal (1906) as a hymn to a tune by Gustav Holst. I raise the issue of winter portrayed in Rosetti’s first stanza because it well illustrates a problem with how many, if not most, evangelicals think about hymns today. Most Christians today seem to view the purpose of hymns as merely good theology set to a pretty tune so that truth is enjoyable to sing. They approach hymn (and poem) texts, therefore, with an eye for propositional accuracy most of all–a very prosaic perspective. Now don’t get me wrong–I do think that it is important to examine the theology of what we are singing, I strongly advocate hymn texts that are rich with doctrine, and we should never sing something that is theologically inaccurate. But to approach poetry as if one is a journalist is to miss the purpose and power of poetry. Poems are not supposed to tell truth in the manner of a history textbook or a newspaper column. In fact, as Leland Ryken once noted, poems are lies that tell the truth. They make statements that aren’t scientifically accurate, but whose imagery grips the imagination and says something that mere factually correct propositions could not on their own. Scripture itself is filled with this kind of poetic imagery. Is God technically a shepherd, a king, or a hen? Considered from the perspective of a court reporter, no he isn’t. But understanding the function of metaphor, he is indeed those things. If Scripture had been written by the aforementioned pastors, they probably would have said, “The Lord is a God who really cares for us and protects us and feeds us. A lot.” But David wrote the divinely inspired words, “The Lord is my shepherd,” metaphorically capturing all of that, and so much more, in a concise manner that grips the imagination. So what Rosetti is portraying in her poem is not a weather report on the day of Christ’s birth. Rather, she is using quite conventional metaphorical imagery to paint a picture of the condition of the world when Jesus was born. This was a harsh world, a world that was cold as ice, dark as midnight, and hard as iron. Think of the picture C. S. Lewis pains in The Lion, the Witch, and the Wardrobe: “Always winter but never Christmas.” Sin had built up upon the world like snow piled upon snow upon snow upon snow. This world was bleak. And it is into this world that the God of Heaven descended. Rosetti beautifully contrasts the bleakness of a cold dark world with the warmth and light of the stable. You can almost see the light and feel the warmth through her words. Contrast Rosetti’s theologically dense imagery with many contemporary Christian songs. Most song writers today either write lyrics that are mere prose set to a catchy tune, or they pack in as many cliche metaphors as they can with no internal coherence or logical narrative. 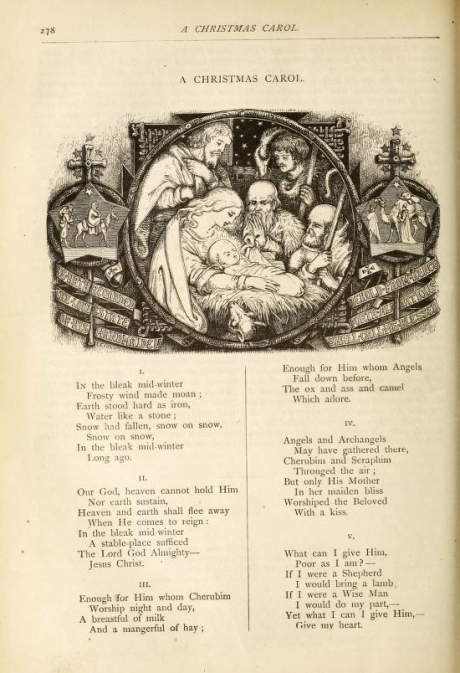 Christina Rosetti is one of the greatest Christian poets in the tradition, and I strongly commend that you include this carol (among others) in your Christmas worship. Not only will the imagery grip the imagination, but it also provides a wonderful opportunity to teach people the real purpose and power of Christian poetry and song. 7 Responses to Was Jesus born in the bleak midwinter? Great thoughts. Thanks. One Christmas hymn I have thought about often is O Little Town of Bethlehem, particularly the fourth stanza and its meaning. Is Brooks concluding the hymn with a plea for for God to save people from their sins? Your thoughts? That seems to make sense, extending the picture Christ’s birth to birth in us (salvation/regeneration). Thanks Scott. Good article. It’s a shame the first verse is a stumbling block of understanding for a lot of people. I told our congregation today while I led worship it’s not a weather report — I think it’s addressing the winter that was in the hearts and souls of the people of Israel at the time of Jesus’ birth. They had sold out to a system of going through the motions and obeying the(often man made) laws and Jewish traditions, making their heart grow cold against God. Thanks for the comment, Chris. Good to hear of people explaining the hymn to their congregations! Thought provoking! Wondered if you would find “In the Garden” good metaphorical poetry, or something else entirely. Hi, Billy. That song certainly makes use of metaphor. The question is whether the metaphors employed rightly picture our relationship to Christ, or do they instead picture the relationship of star struck lovers? I actually believe Christ WAS born in the midwinter. Maier’s article on the date of the birth of Christ and Hoehner’s Chronological Aspects of the Life of Christ give plausible reasons to believe that Jesus was born sometime between the middle of November to early January. But, again, that’s beside the point. :) Scott is exactly right.